1584cc air cooled vee twin with electronic sequential fuel injection, 6 speed "Cruise Drive" gearbox and kevlar/carbon fibre final drive belt. Staggered shotgun exhausts complying with Euro 3 emissions. Steel tubular chassis with rigid mounted engine as a load bearing member. Concealed "Softail" rear shock with adjustable preload. Single front and single rear disc brakes. 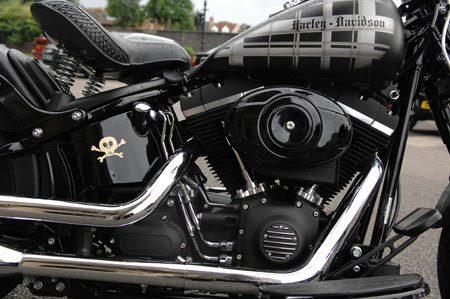 Arrr, a pirate bike, me hearties! Perhaps the title is a little eccentric, but in truth, so is this motorbike. 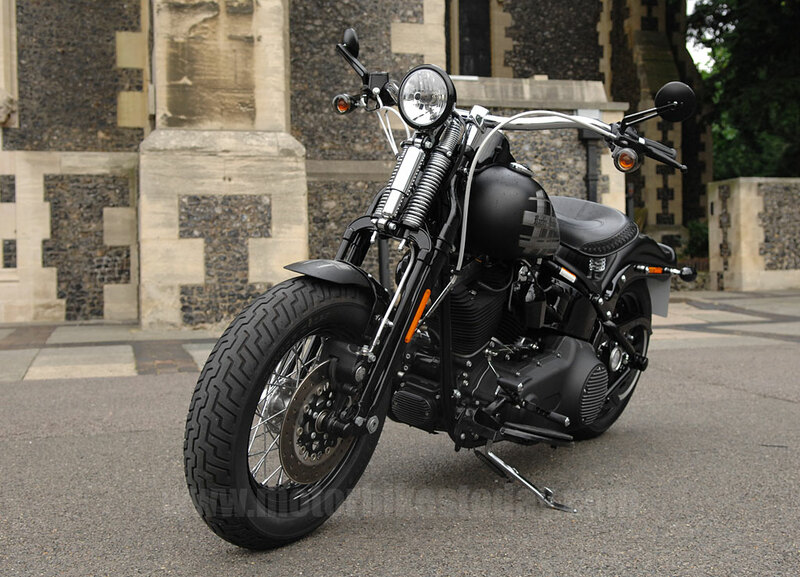 Harley Davidson's Cross Bones is one of the latest in an eclectic range that seems to be getting as many possible variants out of the several base models they make, and as such it's more a styling exercise than anything else. 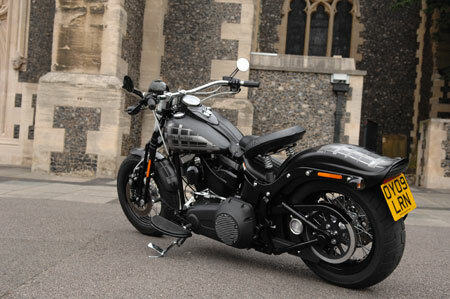 But style, as you may have realised, is something that Harley Davidson do extremely well. In this case, the base model would appear to be the Springer - a Softail that was deleted a couple of years ago. But I'm getting ahead of myself already and starting to use jargon. So to clarify, a Softail is a pretty unique Harley invention. The look apes the rigid framed (Hardtail) choppers of the sixties, but there's actually a pretty good quality shock absorber hidden in the middle of the bike giving a quite good, compliant ride at the back while still looking the part. 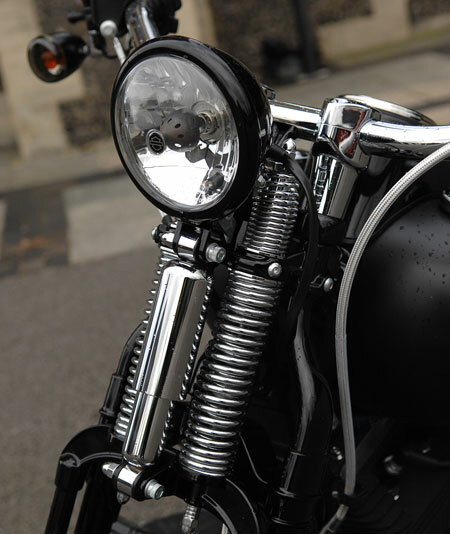 At the front, the Springer is styled after something even older. Instead of the telescopic forks you're used to seeing in one form or another, you get one rigid fork leg on each side with the axle mounted on a pivoting plate at the bottom. This plate is also attached to a second leg running parallel to the forks which goes to a plate below the headlamp. This plate has a couple of shock absorbers attached between it and a rigid plate above, providing front suspension in much the same manner as in the fourties and fifties. It looks magnificent. So what do we get with the Cross Bones? Well, we get some beautifully tooled leather, lots of moody black paint on the engine, frame, everywhere really, the aformentioned Softail Springer frame and Harley's current 1600cc motor. The Softail has the engine mounted rigidly in the frame, giving a little more vibration than usual but it's a pretty smooth beast, vastly improved on the wheezing rattling thumpers of yore. We also get a skull and crossed bones motif on the oil tank. The jury is still out on that. Approaching the bike, the first thing that strikes you isn't the size. Though it's a colossal machine, the size becomes the second main talking point as soon as you get close enough to see the details. Because this bike is simply exquisitely made. Which isn't something you can always say. 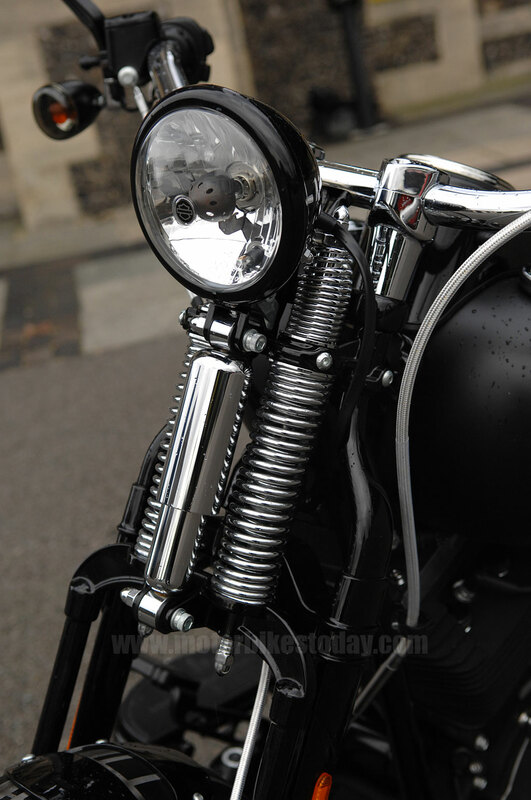 The details are beautiful, and the quality just oozes out of everywhere - the thickness of the chrome and paint, the attention paid to little details you'd never normally notice, it all adds up to a certainty that the sizeable chunk of cash you've thrown at the bike was well spent. There'll be a lot more cash to spend, of course. 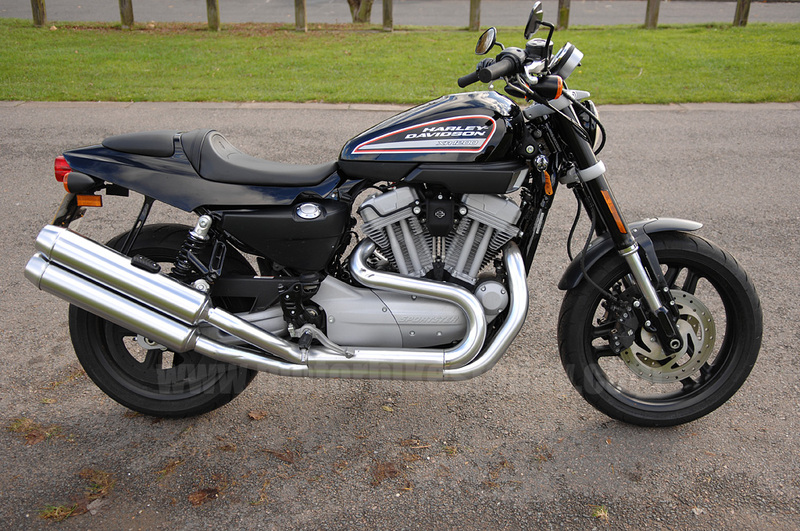 Because it's still fitted with asthmatic Euro compliant exhausts, and while I'd never advocate anti-socially loud pipes, these are just plain wrong on a bike that looks like this. Getting on the Cross Bones is very easy. It's extremely low and quite wide. Getting the sidestand up is always tricky as it nestles under the crankcases on the left. Getting it down is harder still because it's one heck of a reach. But it's doable and you'll get used to it soon enough. Like many of the newest Harleys, the Cross Bones is fitted with their excellent proximity security system which means that if you have the key fob on your person, you can start the bike. If you don't, you can't. Simple. Until you lose the fob, of course. Then you're in trouble. We didn't, but we know of people who have. It's expensive, inconvenient and most definitely Not Recommended. Start the Cross Bones by turning the tank mounted switch on and thumbing the button, and you're rewarded with a rather muted throb and a great dollop of torque reaction as the massive pistons get accelerated from rest for the first time. It feels quite nice, but should sound better. Hmm, I've said that already. I guess it made an impression. The new gearbox is relatively sweet, and you can get the Cross Bones into gear with a fairly delicate kick. No, I'm kidding. 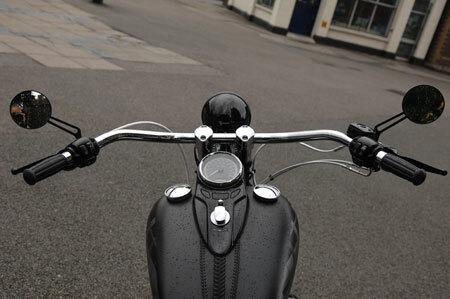 Harley gearboxes have improved beyond recognition, and the current six speed box is really quite good. Pull away and there are no surprises. The clutch is light, everything comes to hand easily enough and the whole package just works. The riding position, admittedly, is totally alien but you get used to it quickly enough and settle down into the Harley Davidson Experience. Why does it feel as though there should be a little (TM) after that? As the pace picks up a little, though, the picture becomes slightly less rosy. Remember how I said the forks were the same as we had in the fifties? Well there's a reason why we don't have them any more. Given more sophiticated shock absorbers, perhaps it could be made quite good. But as it is the front end ride is crashy, underdamped and, surprisingly, undersprung as well. It doesn't feel nice. The wayward forks do have a beneficial effect, though. They rather force, or certainly encourage, the rider to keep his or her speed down. And that's a good thing in this case, because the brakes are the worst I have ever encountered. Harleys don't usually have the most outstanding brakes, but these were truly dreadful. I'm sure they could be improved, and maybe they get better with use (the bike was extremely new) but at open road speeds the Cross Bones was borderline scary. You know what's weird, though? All the while I was riding The Cross Bones I was fretting about the ground clearance (relax - there isn't any but everything folds up), the brakes (they're rubbish, so plan ahead and ride accordingly) and the front suspension (see brakes). And yet the whole time I was grinning as well. Because somehow, whether in spite of or because of its shortcomings, the Cross Bones is actually a pretty enjoyable bike to ride. Because it genuinely does look absolutely brilliant. Though getting on it to take it out for pictures in one piece leatehrs xomplete with knee sliders does make the whole thing a little, um, incongruous. But it's not just the looks. It feels, somehow, just right. And oh my word is it comfortable. The beautifully tooled saddle cossets your bottom in away that... well let's just say it does a fine job of protecting your piles, should you be so blessed. Copyright © Motorbikestoday.com 2009. All rights reserved. Users may download and print extracts of content from this website for their own personal and non-commercial use only. Republication or redistribution of content, including by framing or similar means, is expressly prohibited without the prior written consent of Motorbikestoday.